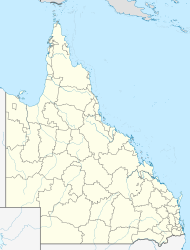 Muttaburra /ˈmʌtəbʌrə/ is a town and locality in the Barcaldine Region, Queensland, Australia. In the 2016 census, Muttaburra had a population of 88 people. Muttaburra is in the central west of Queensland. The town is located on the banks of the Thomson River, approximately 120 kilometres (75 mi) north of the town of Longreach and 84 kilometres (52 mi) north of Aramac. The Great Dividing Range is the main feature to the east of Muttaburra. The region is a sub-basin of the Great Artesian Basin. The Great Artesian Basin supplies water from bores to the towns of Muttaburra and Aramac. The area is well known for its good quality land that is used for sheep and cattle grazing. The main industry of the Muttaburra area is grazing. The name of the town derived from an Iningai clan name, the Muttaburra, who were the traditional owners of this area. According to some sources, muttaburra meant “the meeting of waters” or "camping ground" or "meeting place". The area was once part of a vast inland sea. "The Land Commissioner has been round this way lately, and surveyed the new township, one and a half mile from Mount Cornish; its name I do not know, and I don’t think anybody else does, as it is undecided. I hear there is a store open now, also a public house, and I suppose there will be other business places shortly." The town was officially declared in 1878. Bruford Street, the main street, took its name from a saddler, Mr. Bruford, who established a saddlery repair shop there, in that same year. The need for other services, such as hotels, the Cobb & Co changing station, blacksmiths, banks and general stores were also soon accommodated. 50 allotments of Crown Land were made available to the public for sale by public auction at Aramac on the 18 June 1878, at which "Mr Sword, Land Commissioner, disposed of forty six town allotments situated at Muttaburra. They were one acre divisions, upset price £10. Twenty three fetched the upset price, the remainder sold at a considerable advance, two of the lots realising £50 each." The first post office was built in 1887 and then replaced with a modern building in 1926. Muttaburra was also the scene of one of the most daring acts of cattle duffing ever performed in Australia. Henry Radford stole cattle from Bowen Downs Station and drove them 1,300 kilometres (810 mi) through the mostly unexplored Central Australia region to the Blanche Water station in northern South Australia. He sold the livestock for £5000, and was later charged with theft and tried at the Roma District Court. Despite overwhelming evidence from the prosecution and no witnesses put forward by the defence, a jury found him not guilty within an hour. He was greatly admired for crossing Central Australia unscathed. The transcript of the delivery of the verdict reads, "Judge: What is your verdict? Foreman of the Jury: We find the prisoner 'Not Guilty'. Judge: What? Foreman of the Jury: Not guilty. Judge: I thank God, gentlemen, that the verdict is yours, not mine!" Family of George and Edwina Bunning, 1912, descendants of the Edkins family. One of the prominent early settlers to establish themselves in Muttaburra was Edward Rowland (Rofley) Edkins, who was the first Manager of Mt. Cornish, the original outstation of Bowen Downs. He was also Chairman of the Aramac Divisional Board (1882, 1886 - 1888, 1891,and 1902); a member of the Muttaburra Hospital Committee (1885); Muttaburra Jockey Club President (1891); Muttaburra Hospital Committee President (1891); and Marathon Pastoral Society President (1891). He died at Drummoyne, Sydney, on 14 August 1905. Edkins married Edwina Marion Huey, daughter of Dr Walter Huey (1797-1843) of Launceston in Tasmania. Edwina was well known in the district, and also a composer of a number of musical works, related to the area, including Malboona Gavotte, Wee Bimba: waltz, The Women of the West and the LC5 Waltz She was remembered as "the most kindly of kind hostesses and the wife of one of the most outstanding men of the pastoral industry in Australia". in 1884 a hospital was built with funds raised by the local community. The first doctor was Dr Overend from Melbourne and Mr Lawry was the first Wardsman. By 1901, the Muttaburra Hospital was equipped with one of the earliest x-ray units to be installed in any country hospital. The town dam was built in 1885 by Mr Hudson. For some years this dam was the source of water for the town and water carted into town in casks. Residents paid 2/6 per cask although double this amount was not uncommon. Later the dam was also used as the town's swimming pool. 90 men and women from the Muttaburra district served in some capacity in the First World War. In 2015 a new memorial was designed and installed by J.H. Wagner & Sons. The front face of the memorial has three bronze sculpture badges for Australian Army, Australian Navy and Australian Air Force. The Muttaburra branch of the Country Women's Association was formed in August 1927 with 34 financial members. The Ruby Bayliss QCWA Hostel opened in 1955 to provide accommodation for out-of-town expectant mothers. There is still[when?] a branch of the C.W.A. in the town. In 1963 Muttaburra was the discovery site of the Muttaburrasaurus, one of Australia's largest dinosaurs, by Doug Langdon The dinosaur is believed to have been 12 metres (39 ft) long, 2 metres (6.6 ft) high from the hip and weighing 15 tonnes (17 short tons). It was a herbivore, with rows of grinding teeth, and probably ate plants such as ferns, cycads and conifers. It may have lived in herds. Muttaburrasaurus lived around 100 million years ago, during the Cretaceous period. Several specimens of this dinosaur have been found in central and northern Queensland, and a few teeth have been found in New South Wales. There is a full size replica in the town. At the 2006 census, Muttaburra and the surrounding area had a population of 106. The Muttaburra Public Library building was opened in 1961. In 2017, the 4732 postcode (which includes Muttaburra) was one of the lowest 10 postcodes by income level in Australia, with an average income of $21,415. Muttaburra has a range of sporting activities and facilities including fishing, rodeo, golf course, an olympic size swimming pool, shooting range, tennis courts and race course. Due to the small size of the town there is almost no public transport, however Longreach does run a bus service to the town one to two times a month. The town also has a small airport, Muttaburra Airport. The Muttaburra Hospital closed in 1974 due the small population. There is a Primary Health Care Centre for minor treatments and care, as well as ambulance services and 24/7 emergency on-call services. Muttaburra relies on the hospital in Longreach or Townsville plus the Royal Flying Doctor service. Muttaburra State School is one of the oldest schools in the district. The school was opened in 1884 with an enrolment of 17. Enrolments peaked at 112 in 1903. In 1937 the new school building and teacher's residence were completed. The school currently operates as a one-teacher school. Principals tend to stay for about one to two years and then relocate. The staff demonstrate a high degree of professionalism and provide a high quality learning environment. There is strong support from the parents involved in the P&C and sub-community groups such as the SES and Rural Fire Brigade. Barcaldine Regional Council operates a library at 20 Bruford Street. The Muttaburra branch of the Queensland Country Women's Association has its rooms at 33 Edkins Street. Muttaburra has a subtropical climate with very hot summers. Temperatures over 37 °C (99 °F) and heat waves are common, however in winter the temperature can go as low as 8 °C (46 °F), if not lower. Frosts occur rarely. Most of the rainfall occurs in the summer months with falls around the 400 to 550 millimetres (16 to 22 in), Flooding can occur most years and in the "big wets" large areas of the major watercourses are inundated. Droughts are not uncommon. The wettest month ever recorded was September 2010 when 162 mm fell. Bush-walking, water-skiing and fishing are some of the main recreational activities in the area. The headwaters of the Thomson River and the camping area at Broadwater and the Muttaburra Pump Hole, is where species such as Yellowbelly and Black Bream can be caught. Other attractions are found in Muttaburra itself, including the Memorial Medical Museum and the Cassimatis Store. The Memorial Museum commemorates Dr Joseph Arratta who served for thirty-five years at the hospital in Muttaburra from 1925 to 1960. The museum is housed in what once was the Muttaburra Hospital. After its closure the building was converted into a historical display and museum and named in honour of Dr Arratta. He was awarded an M.B.E. in 1959 in recognition of his service to medicine. The Cassimatis Store opened in 1914 but was closed in 1978 having been a bank, green grocery, haberdashery, emporium, cafe, white goods merchant, and liquor store. In 1911, Andrew Andrew (A.A.) Cassimatis and his son George left the island of Kythira (which lies between Crete and the mainland of Greece) to come to Australia. They worked in Sydney and Bundaberg before establishing themselves in Muttaburra. They built their own general store in 1918, after renting local properties for a number of years. The Cassimatis became one of the oldest agents in Australia for Mobil Oil – Australia – previously known as The Vacuum Oil Company of Australia. They also bottled their own methylated spirits and kerosene, using their own label. George Cassimatis was a J.P. and Councillor representing Muttaburra on the Aramac Shire Council. He sat on various committees and played a significant role in the developmental history of Muttaburra. The store was reopened in 2001 after a full renovation. Fire destroyed the store in the morning of 6 January 2009. However the shop and service station has now been rebuilt by A. E. Rose Constructions (Peter Rose), and is open for business again. The home of George and Stavroola Cassimatis and their five children has been restored and is open to the public. Originally a drover’s cottage situated alongside the family’s general store it was built in 1903 and purchased by George Cassimatis in 1934. The Muttaburra rest area provides the first two nights stay free plus meals and accommodation are also available at the Exchange Hotel on the main street. The Caravan Park has powered sites, barbecues and a washing machine. Hot food, groceries and fuel are available at the local store. In May 1891 approximately 400 shearers camped near Muttaburra during the great shearers' strike. Union Hole is where the shearers drew water and carted it back to their camp by dray. There are still some remains of the campsite visible today. On the first Saturday of June each year the Landsborough Flock Ewe Show is held. The show has sheep and wool judging, cattle displays, trade displays, ladies pavilion, shopping, activities for kids, cattle drive plus dinner and entertainment. ^ a b Australian Bureau of Statistics (27 June 2017). "Muttaburra (SSC)". 2016 Census QuickStats. Retrieved 23 February 2018. ^ "Muttaburra - town (entry 23679)". Queensland Place Names. Queensland Government. Retrieved 13 June 2017. ^ "Muttaburra - locality (entry 47089)". Queensland Place Names. Queensland Government. Retrieved 12 June 2017. ^ "Muttaburra". Muttaburra. Retrieved 26 January 2017. ^ "Landsborough River". The Brisbane Courier. Queensland, Australia. 10 October 1877. p. 5. Retrieved 26 January 2017 – via National Library of Australia. ^ a b c Environmental Protection Agency (Queensland) (2002). Heritage Trails of the Queensland Outback. State of Queensland. p. 147. ISBN 0-7345-1040-3. ^ a b "Dr Arratta Memorial Museum". Muttaburra. 12 March 2015. Retrieved 26 January 2017. ^ a b "Muttaburra Town Heritage". Muttaburra. 11 March 2015. Retrieved 26 January 2017. ^ "Northern News". The Brisbane Courier. Queensland, Australia. 15 July 1878. p. 3. Retrieved 26 January 2017 – via National Library of Australia. ^ a b "Muttaburra". The Age. The Age Company. 8 February 2004. Retrieved 14 November 2010. ^ a b c Denholm, Zita. Australian Dictionary of Biography. Canberra: National Centre of Biography, Australian National University. ^ "E. R. Edkins". Muttaburra. 2 April 2015. Retrieved 26 January 2017. ^ "EDWINA MARION EDKINS". The Longreach Leader. Queensland, Australia. 3 December 1941. p. 5. Retrieved 26 January 2017 – via National Library of Australia. ^ "MUTTABURRA". Morning Bulletin. Queensland, Australia. 21 September 1885. p. 5. Retrieved 26 January 2017 – via National Library of Australia. ^ "MUTTABURRA". Morning Bulletin. Queensland, Australia. 30 December 1885. p. 5. Retrieved 26 January 2017 – via National Library of Australia. ^ a b c d Council, Barcaldine Regional. "Muttaburra - Barcaldine Regional Council". www.barcaldinerc.qld.gov.au. Retrieved 26 January 2017. ^ "War Records". Muttaburra. Retrieved 26 January 2017. ^ "Queensland Country Women's Association (Muttaburra Branch)". The Longreach Leader. Queensland, Australia. 9 September 1944. p. 7. Retrieved 26 January 2017 – via National Library of Australia. ^ "Queensland Country Women's Association". QCWA. Retrieved 26 January 2017. ^ a b "Muttaburrasaurus". www.qm.qld.gov.au. Retrieved 26 January 2017. ^ a b Council, Barcaldine Regional. "Muttaburra - Barcaldine Regional Council". www.barcaldinerc.qld.gov.au. Retrieved 26 January 2017. ^ Australian Bureau of Statistics (25 October 2007). "Muttaburra (Aramac Shire) (State Suburb)". 2006 Census QuickStats. Retrieved 25 October 2008. ^ "Public Libraries Statistical Bulletin 2016-17" (PDF). Public Libraries Connect. November 2017. Retrieved 29 January 2018. ^ "Mt Cornish Homestead (entry 600009)". Queensland Heritage Register. Queensland Heritage Council. Retrieved 6 July 2013. ^ Bond, Nicole; Varley, Russell (26 October 2017). "Cost of living Queensland: Could you live on just over $400 a week and still enjoy yourself?". ABC News. Archived from the original on 12 December 2018. Retrieved 12 December 2018. ^ "Aramac Shire | Queensland Places". queenslandplaces.com.au. Retrieved 26 January 2017. ^ "Muttaburra Primary Health Care Centre | Queensland Health". www.health.qld.gov.au. Retrieved 26 January 2017. ^ Muttaburra Primary Health Care Centre Profile. Queensland Health. ^ a b "Our school". muttaburss.eq.edu.au. Retrieved 26 January 2017. ^ "Libraries". Barcaldine Regional Council. Retrieved 8 May 2017. ^ "Muttaburra Library". State Library of Queensland. Retrieved 26 January 2017. ^ Julia Harris & Amy Phillips (4 October 2010). "A record-breaking September". ABC North West Queensland. Australian Broadcasting Corporation. Retrieved 14 November 2010. ^ a b "Dr Arratta Memorial Museum | Monument Australia". monumentaustralia.org.au. Retrieved 26 January 2017. ^ a b "Cassimatis General Store". Muttaburra. 12 March 2015. Retrieved 26 January 2017. ^ Tuesday 6 January 2009 Morning Round Up. Department of Community Safety. ^ "Heritage Trail". Muttaburra. Retrieved 26 January 2017. ^ "MUTTABURRA. - [FROM OUR OWN CORRESPONDENT.] - Morning Bulletin (Rockhampton, Qld. : 1878 - 1954) 5 May 1891". Trove. Retrieved 26 January 2017. ^ "Landsborough Flock Ewe Show Society Inc". www.queenslandshows.com.au. Retrieved 26 January 2017. This page was last edited on 1 January 2019, at 01:12 (UTC).